Boil pork soup and minced pork in a pot. Boil it around 1 hour or more than 1 hour. Heat water in a boiling . and then boiled the noodle take time just 10 sec. and then put it in a bow. Boiled bean sprouts, pork and meatballs. Put it in a bowl. 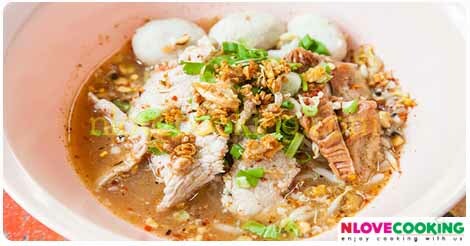 Prepare a bowl put soup a 10 tablespoon, minced pork, fish sauce, sugar, lemon juice, pepper and crushed peanuts. Mix it to combine. Put soup that already mix to a bowl that have noodle. Put onion on the top and then serve separate with soup bowl.